Orleans County is one of the four northernmost counties in Vermont . It has the largest area of the three counties comprising the Northeast Kingdom and lies between the eastern and western ranges of the Green Mountains . 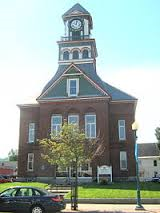 Orleans County includes the communities of: Albany, Barton, Beebe Plain, Brownington, Charleston, Coventry, Craftsbury, Derby, Derby Center, Glover, Greensboro, Holland, Irasburg, Jay, Lowell, Morgan, Newport, Troy, Westfield, and Westmore. Situated on a quiet street on the East-side of Newport, this 2-unit apartment building has a lot to offer for the price. This was originally a single family home and could very easily be again with minimal work. Everything appears to be solidly built and with some updating this property has a lot of potential. Currently the main level offers a one bedroom apartment and the 2nd floor offers a one bedroom efficiency apartment. Separate heating sources (OHA on 1st floor & propane wall unit on 2nd floor) and one electrical meter. Additionally you will enjoy the large front covered porch, private back yard and a friendly neighborhood. Being sold As-Is, needs TLC. Would make a good investment property. Or if your handy, purchase at the low price and conquer the projects yourself. This well-insulated two room camp needs some finishing touches. Has propane heat, dug well and underground power. Large enclosed porch. Sits on 46.9 acres with nice view and trails throughout the woods with some nice maples. Near the Craftsbury Cross Country Ski Center and Caspian Lake. Wooded 12.7-acre lot is ideal spot to build your hunting camp or getaway cabin; it is nestled between VAST Trails 100 & 105 and just 12-miles from Jay Peak Resort. Logged several years ago it now has new growth. Soils look good for septic. Access is available from either Route 100 or off Buck Hill Road. Nestled in the quaint community of Alpine Haven is a 2+ Bedroom 1.5 bath Chalet with lovely front landscaping, just minutes away from Jay Peak and all that it offers. This property is being sold fully furnished. The first floor was remodeled in 2016 to include a new updated kitchen, dining room, living room and bathroom. Wiring and plumbing were updated at the same time, and offers a generator with full house transfer switch. A 1/2 bath is located on the second floor along with two spacious bedrooms. There is a finished office space that could easily be converted into another bedroom or family room (no permits needed). A new full length deck was put on the front of the house in the fall and offers plenty of space for barbecuing and entertaining on those lovely summer evenings. As a member of the association, you have full use of the lovely in ground swimming pool, tennis court, garbage removal and snowplowing in the winter. Do not forget to take advantage of the many walking trails in the community which you can snowshoe in the winter. The added bonus is the finished and heated shop/garage, giving the home an extra 300+ square feet of space. 1000 gallon concrete septic tank installed in 2014. A rare opportunity of a piece of land to build your dream get away in the beautiful surroundings of the North West corner of Lake Willoughby, with 148.2 feet of private water frontage. Southeast facing with 180 degree views of the lake and surrounding mountains. Crystal clean lake formed by a retreating glacier: famous for swimming, fishing and boating. A septic design is available and electricity is on the adjacent property. Westmore features some of the greatest hiking in VT. A short 25 minute drive to Burke Mountain & Kingdom Trails while only 2 hours from Montreal, 4 hours from Boston. Adjoining 29.3 acres with historical Manor house is also being offered for sale. Get the feel of a country seclusion, yet located in town. This 1.10 acre building lot is ideal for a residential or multi-family home. Located on sandy soil overlooking Lake Memphremagog and adjacent to public water, sewer and electricity. Some open area but mostly wooded. Private setting yet close to all city amenities. Lot has potential to be sub-divided if desired. Spectacular architecturally significant circa 1900 Victorian Manor majestically situated above Lake Willoughby, the "Lake Lucerne" of America, in the Northeast Kingdom of Vermont. Southeast facing with 180 degree views of the lake and surrounding mountains. Crystal clean lake formed by a retreating glacier: famous for swimming, fishing and boating. Original architectural features with extensive updates. 6/7 bedrooms, 5 baths with legally separate 1 bedroom, 1 bath caretaker/in-law or income apartment. Updates/upgrades include thermal windows, foundation & structural upgrades, extensive insulating, landscaping, drainage, as well as an almost completed new kitchen with stainless appliances, a downndraft cooktop, granite counters and breakfast nook. Additional buildings include two restored summer cottages, the ice house (chapel) and a grandfathered bath house and dining hall both with restoration potential. A rare opportunity to enjoy almost 30 acres of land with 138 feet of private waterfront. Private, peaceful and with flexible future usage: extended family, luxury conference/wedding center or private year round home. Westmore features some of the greatest hiking in VT. A short 25 minutes drive to Burke Mountain & Kingdom Trails while only 2 hours from Montreal, 4 hours from Boston. Adjoining 1. 6 acre lot with 148.2 feet of waterfront available. Spectacular architecturally significant circa 1900 Victorian Manor majestically situated above Lake Willoughby , the "Lake Lucerne" of America , in the North East Kingdom of Vermont. Southeast facing with 180 degree views of the lake and surrounding mountains. Crystal clean lake formed by a retreating glacier: famous for swimming, fishing and boating. Original architectural features with extensive updates. 6/7 bedrooms, 5 baths with legally separate 1 bedroom, 1 bath caretaker/in law or income apartment. Updates/upgrades include thermal windows, foundation & structural upgrades, extensive insulating, landscaping, drainage, as well as an almost completed new kitchen with stainless appliances, a downdraft cooktop, granite counters, and breakfast nook. Additional buildings include two restored summer cottages, the ice house (chapel) and a grandfathered bath house and dining hall both with restoration potential. A rare opportunity to enjoy almost 30 acres of land with 138 feet of private waterfront. Private, peaceful and with flexible future usage: extended family, luxury conference/wedding center or private year round home. Westmore features some of the greatest hiking in VT. A short 25 minute drive to Burke Mountain & Kingdom Trails while only 2 hours from Montreal, 4 hours from Boston. Adjoining 1.6 acre lot with 148.2 feet of waterfront available. A real charming Post and Beam year round cottage on Lake Salem is available now!! Right on the water this cottage /home has a full basement, two bedrooms with an expanded loft and is perfect for a family. Enjoy the lake all year with swimming, boating, fishing in the summer and skiing, snowmobiling & ice fishing in the winter. A whole lot of value for the money. Perfect opportunity to own a nice lot in Newport, VT. Great neighborhood, close to town yet just outside of the city. City water, power at the street and permitted for a conventional septic system. Ready to go for building your new home. Potential for nice views with some clearing of trees. Completely updated raised ranch on nicely landscaped lot located at city's edge. Home was taken down to the studs and completely renovated inside & out 2009-10. Improvements included new insulation, Sheetrock, french doors to the deck, windows, chimney, propane fireplace, floors throughout, Kitchen cabinets, granite counter tops new SS appliances, hardwood, bath lighting & ceiling fans. New entrance, stairs, & front doors, air conditioning & heat pumps, siding & garage doors. Enjoy the newly enclosed deck and hot tub. Move in ready. Best price in Derby....over-sized Split Entry home just waiting to become your family home....Open concept Kitchen, living and dining area, 2 bedrooms on the first level, 2 additional finished rooms freshly sheet rocked and painted with a bathroom on the lower level, Daylight windows surround the lower level.....Open concept lower level additional space partially finished family room just needs your flooring choice....a Washer/Dryer hook up...the owners have priced this home to sell...don't wait on this one...Garage is not usable, needs work. Come and build your dream waterfront home on Lake Salem. High and dry on a hill sits a 2017 5th wheel camper to stay in while you build your 32'x32' permitted structure. Drilled well, driveway and septic already in place! Power in corner of lot on site. No flood zone. Lot is adjacent to the Lake Salem boat access and cemetery. Camper has 2 bedrooms and 3 slide-outs. Attractive 2 bedroom one bath single story home with partially finished basement. Over-sized 2 car garage attached on 1.7 mostly open acres. One enters the front of the house via a covered front porch to a newly carpeted living room. This continues to a large dining area with matching carpet. (There is hardwood flooring under the carpet). There is a untility room and laundry off these two rooms. Next is the kitchen with upper and lower cabinets, vinyl floor and eating area. There is a short hall to the 3/4 bath with handicap shower. A small bedroom with closet is on the left of the hall, and a large master bedroom was created by making two small bedrooms into one. Basement stairs from the kitchen lead to a finished den with gas fireplace and v-groove walls. There is a storage room and utility closet for well tank and on demand water heater. A former basement garage is now used as unfinished basement space. Also basement under the front porch. There is a garage addition on the east side of the house. One bay is high for an RV camper, and there is a regular sized bay. The house has cedar shingle siding with vertical board siding on the porch and garage. Lawn surrounds the house with plenty of garden space. 2 Exceptional building lots with the most incredible views of Beautiful Lake Memphremagog on the street. You will love the area, so convenient to all services. Build your forever home; water and sewer available. Owners may sell separately as they are 2 separate lots. Price is for both. Caspian Lake View Home. A beautiful private setting for a 3 bedroom 2 bath cape at the end of an acre field overlooking Caspian lake. The home is equipped with a full kitchen with laundry closet and pantry closet. Next is the dining area which opens to a large carpeted living room with fireplace. Continue past the living room to the carpeted first floor bedroom. A large bright space with private full bath with closet and linen closet. The front of the house is graced with three picture windows to take advantage of the southern sky and Caspian Lake view. The second floor has two large carpeted bedrooms each with built-in desks, closets, and in the master, a built-in dresser. A short hall between accesses the modern full bath. There is a partial basement housing an electric water heater, hot air oil furnace, two 275 gal oil tanks and new circuit breakers. The property consists of 6.01 acres of which the house sits in the middle. Open field to the south, mixed mature woods of mostly softwoods to the west and north. A lovely homestead.